Ahead of the Red Bull X-Fighters World Tour return to Pretoria this Saturday, South Africa’s own Nick de Wit and Frenchman Rémi Bizouard showed off spectacular freestyle motocross tricks complementing a picture-perfect sundown in the wilderness. 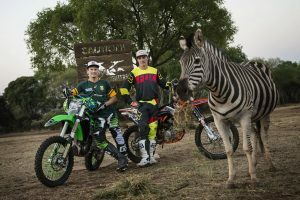 PRETORIA (South Africa) – The largest land animal on Earth — the African elephant — faced riders from the planet’s most prestigious freestyle motocross series, ahead of the hotly anticipated return of Red Bull X-Fighters to South Africa on September 12. After an impressive 2014 debut in Pretoria, the buzz for Saturday’s showdown is off the charts. The track once again spreads across the tree-filled terrain of the historic Union Buildings to show off the riders’ newest tricks. South African FMX legend Nick de Wit gave Red Bull X-Fighters contender Rémi Bizouard of France a reminder of just how wild it can be to ride Africa’s red dirt when he took the Frenchman for a session in the wide-open savanna. On Saturday, Bizouard will be charging with the rest of the 12-man field, which includes seven previous Red Bull X-Fighters event winners and top title contenders like Australia’s Clinton Moore and Josh Sheehan, as well as Tom Pagès and David Rinaldo from France.